At WinStar, our team loves coming together and giving back to the community. On Oct. 24, our staff members and their families participated in our fall blood drive. Providing ways for our employees to help others is important to us, and giving blood is a perfect opportunity to do that. The Oklahoma Blood Institute plays a vital role in our commitment to the community by bringing their team to WinStar several times a year to facilitate opportunities to donate blood. In 2016, we had 958 donations from the blood drives held at WinStar. After our fall blood drive, we received word that we had a record-breaking 1,025 blood donors in 2017! How awesome is that? Our employees and their families went above and beyond, and we are extremely grateful for everyone who took part in the blood drives this year. The best part of giving blood is knowing that we’ve made a lifesaving difference for so many people in need. The OBI partners with 2,500 businesses, schools and organizations annually to conduct more than 4,000 blood drives across the state, including the four we held this year. Through these blood drives and individual donations at their donor centers across the state, the OBI is able to collect more than 250,000 blood donations yearly. WinStar is the largest blood donor in the state of Oklahoma, and it is all because of our amazing employees! With the help of the OBI, poker manager, Jay Wiles, and entertainment manager, Stephanie Callaway, our blood drives give our employees a way to directly support Oklahomans. 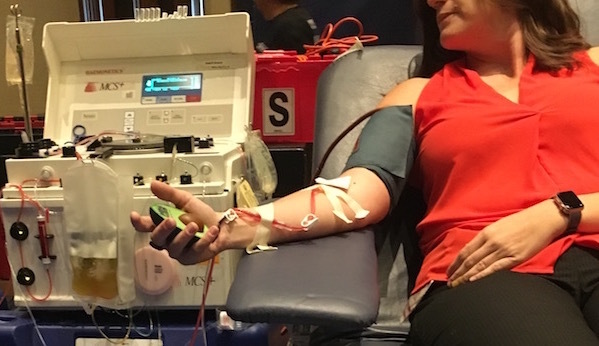 If you would like to learn more about the Oklahoma Blood Institute and be a part of saving lives, donate at one of their many donor centers and mobile drives across the state. Thank you to everyone who came out to make our blood drive a success!